Have you turned in your PRIDE Reports????? Here you will find all of the latest updates and coolest stories from our division! Please look through the posts, comment, and let me know if you have an awesome story you would like the division to hear! Children's Miracle Network Fundraiser Breaks New Record!!!! On September 28th, our division came out for what would be the most successful divisional fundraiser in memorable history! Raising nearly $2000 for the Children's Miracle Network, we had over 250 Key Clubbers come out to play mini-golf with their fellow Key Clubbers at AllGolf in CB Smith Park! 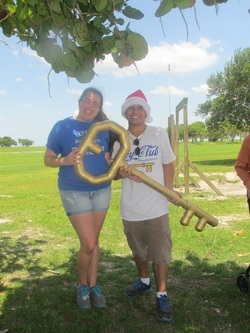 I have to congratulate Everglades High School for hosting this wonderful event and Cypress Bay High school for winning the spirit stick from the previous winners, Pembroke Pines Charter! I am so proud to announce how many people attended KCKC from Division 24B! We had, in total, 361 attendees, breaking our divisional record and bringing to the most people to what would become the largest KCKC in FLORIDA DISTRICT HISTORY!!!!! Not only this, but we were also commended for the fact that 100% of our clubs had representation at the event, a success unmatched by any other comparative division. I am feel so honored to be leading such an amazing group of presidents to get these result. Special congratulations are in order for Cypress Bay High School who, with over 95 attendees, was the largest delegation from our division and the second largest at the event! It was an absolute privilege and honor to not only attend Key Club's International Convention, but also be this year's International Convention Chair! Along with me came two very special members of our division, the President, Maria Rodriguez, and Vice President, Kristina Reyes, of West Broward High School!!! Thank you Maria and Kristina for representing our division fantastically well! At ICON, we all learned so much, and as a member of the District Board, I know you will experience a District Board that is now closer than ever! Along with workshops and ceremonies, ICON was made perfect by our special Florida Tour of Washington DC, and trust me, we saw everything in DC! The next International Convention will take place in picturesque Anaheim, California, so get prepared to show off the Mighty Mighty Florida District at Disney! A Peaceful Transition of Spirit! 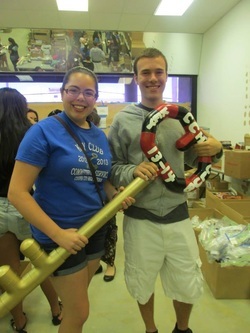 At our June DCM, Cooper City High School Key Club presented a beautifully painted Spirit Stick to Flanagan High School! CONGRATS FLANAGAN HIGH! Flanagan won this month's Spirit Stick because they held a wonderfully organized Summer Board Meeting that caught my eye. President, Philip (Pearson) Smith, sent over an incredibly detailed recap, and I am certain they are destined to accomplish a lot this year! Remember, all Spirit Sticks are meant to be painted or lightly decorated in some way by the winning club. However, the most important task for Flanagan is to make a nice wrap-around, or ribbon if you may, that will go around the Spirit Stick. If things go according to plan, we should have a band for every club in our division by year's end!!! Congrats Cooper City! You won this year's first Spirit Stick because you not only planned a PERFECT April DCM, but you also have maintained your presence at all other divisional events! Remember, all Spirit Sticks are meant to be painted or lightly decorated in some way by the winning club. However, the most important task for Cooper City is to make a nice wrap-around, or ribbon if you may, that will go around the Spirit Stick. If things go according to plan, we should have a band for every club in our division by year's end!! !